I bought this one for $14.99 back in 1990. This was alot of money for me back in those days because I was only 10 or 11 years old at the time. I remember saving up my money with my brother and together we decided this would be the game for us. It was one of the only games we didn't beat for the Sega Master System. It was a frustrating shooter, and like most kids at this time, we wanted a RPG or a Street Fighter style beat'em up. This game reminded me of an old toy kids in the States we had called "Mr. Bucket". Everyone knows "balls pop out of it's mouth." Same for the Clould Master, he shoots balls out of his mouth. Not impressive to a Junior High kid. So, this game sat on the shelf until the neighborhood theif stole it. I bought this game in a lot off ebay in the US a while ago. It is actually somewhat hard to come by and you may have to pay a little bit more for it then the average game. Especially if you live in the US, like I do. After the "bias" of hating shooters passed my childhood mind, I look at this game in a slightly new light. I use to hate games like R-type and Fantasy Zone when I was a youngster. So, this game was placed in that catagory. Later, I found something great about shooters. First, Galaga was no longer hated, then R-Type was accepted. Then, Could Master was placed in a new love for shooters in my mind set. It is basic, find power ups on fire power and stop at the stores to get a secondard item. They aren't really stores because you don't have money in this game, you select the item from 4 choices. What to use??? The doors floating in the screen look inviting, so don't let them pass you by. Get ready to get angry because just about everything and everyone shoots tiny red balls at you. Forget playing this on a game gear converter, the balls are to small to see. 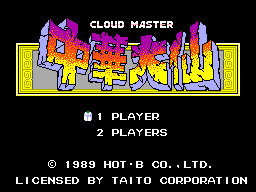 The bosses are hard and I feel "The Cloud Master" is just to big. It is frustrating. The graphics are good but trip you out. Flying birds with human heads, turtles that look friendly and must be shot a million times to kill. 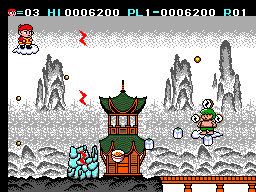 A huge chicken, Buda, a princess shooting lighting bolts or strange items at you. 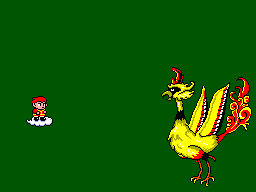 I do like the backgrounds of each stage, but the bosses, there are no backgrounds, ok, the color teal is the background. Wow impressive. Music and sound is good, but the sound of your guy dying makes me mad. He turns charcoal black with a tiny shooting sound as he flies off his cloud. That sound echoes in my mind because I know I have no power ups and must start back at square 1. ARGGGGHH!!!! You know what I'm talking about if you played the game. There are 2 things that make me mad. 1. The size of your guy. He is to big. The bullets are tiny and millions of them fly at you at every angle. Especially after stage 1. 2. They have no power ups to speed your guy up. He travels at the slow rate of speed through out the game. "MOVE AWAY" from that bullet that travels twices as fast as you, ARGH Black Charcoal and that annoying sound. Time to start at square one. No way to win now. Once your dead one time, you loose all the power ups, might as well restart unless you are a Cloud Master god. Challenging, so there is replay value. But like games like Tetris or Power Strike, there is only so many times you can replay in a row in a single day. A couple times a day is enough or you may get so mad a controller may go through a TV screen. If you like shooters for the Sega Master System, this one is for you. If not, don't bother.